(limonene from lemons and the isoprene rubber of a party balloon are very much alike). If the HSP were not close, such as the case for water relative to these same materials, the “solvent” would not be good. There are three numbers that together are called HSP. These fully describe how the solvent behaves in relation to many other things if their HSP are known or can be estimated. There are HSP for such common things as sugar and butter, but even aspirin, phthalates, drugs, and DNA have HSP. The HSP describe whether things prefer to be near each other or not. Water will not wet many surfaces because the HSP are too different, for example, but it dissolves sugar (to a large extent) since the HSP are close enough (but not a perfect match). In practice solvents are represented as points in a three dimensional space called HSP space. This is because there are three parameters (δD, δP, and δH) that are required to describe where they like - or dislike - being found. What they dissolve, or like to be together with, will have similar HSP. It has been found that perfect HSP matches are not required for complete solubility, however. If one tests many solvents to see whether they are good or bad for the sticky spruce resin, one finds that the good ones clump together in a three dimensional plot that forms a sphere in the three dimensional HSP space with the HSP of the sticky spruce resin in the middle. There are characteristic differences in HSP in all three parameters that are allowed for good compatibility. These determine the radius of the sphere. Good solvents are within the sphere while bad ones are located on the outside. Such spheres have been determined for hundreds of different things. In many cases their validity has been confirmed by correct predictions that mixing two non-solvents would dissolve a material when the HSP of the solvents were on opposite sides of the HSP sphere. Their mixture has HSP that depend directly on the relative amounts present, and becomes predictably “good” even though the individual solvents are not. Such synergistic mixtures are very important in practice and have been used to replace undesired solvents, to reduce costs, and to improve performance all at the same time. 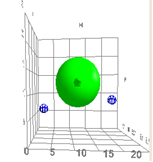 The HSP correlation for rapid skin penetration by solvents is represented by the green sphere. Dioctyl phthalate (DOP) is represented by the small ball to the left and ethanol is represented by the small ball to the right. The 50/50 mixture will make it much easier for DOP to enter the skin. This is because the HSP for mixtures are additive according to the respective volume fraction of its components, and in this case the mix will be closer to the HSP of the green sphere. What can perhaps be surprising is that one can assign HSP to so many different things. Gases like carbon dioxide, solids like carbon-60, sugar, and biological materials like human skin, depot fat, DNA, and even some proteins all have HSP. The list can be continued with drugs, polymers, plasticizers, and in fact any organic material and even many inorganic materials like salts. The only requirement for an experimental confirmation is that the material must behave differently in a sufficient number of test solvents upon contact. One must find “good” and “bad” solvents. The definition of good can vary from swelling to totally soluble, from suspension of particles (pigments, fibers) for long times versus rapid settling, to rapid permeation through protective gloves to good protection, that is, no permeation. All of these tests have been used to assign HSP. Once the HSP are known one can systematically design products to meet given requirements, or interpret experiments to find out why things did what they did, even in complicated cases. The predictive ability is immense, and the understanding provided is satisfying to the curious who want to know why. In the past it was surprisingly difficult to apply these simple concepts. But with HSPiP to do much of the interpretation and lots of data on solvents and other materials available in a useful format, things are much easier. There is enough information to allow reasonable predictions by computer only and the HSP of new or untested materials and combinations can be estimated allowing study of what they can or can not do. While these predictions are not as reliable as experimental determinations, they allow sorting what is promising from what is not. This selection of what to test can save enormous expenditure of time and money. More detail related to the scientific background for the HSP is provided elsewhere on the website for those who wish to proceed to a fuller understanding. But to sum up in general terms, HSP tell the user where something prefers to locate. This is where the HSP are reasonably similar to its own. This can then lead to swelling and/or complete solubility, wetting and/or adsorption, permeation, or other related phenomena.